cutting board and one of their medium nylon knives. My daughters could not wait to use them. We were not really doing anything that night to use the cutting board, so they decided to slice cookie dough and make cookies. Not a big test for the knife, but they enjoyed themselves anyway. They did get to use the cutting board and knife later in the week on potatoes that I had already sliced up. It worked well and I did not have to worry about them slipping and cutting themselves. Thank you Curious Chef!! 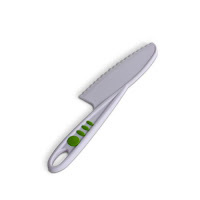 dedicated to real kitchen tools for small hands. 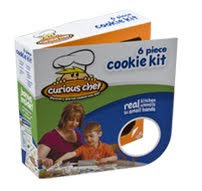 We invite you to learn more about Curious Chef®, as well as the company behind the brand. Your interest and feedback is always welcomed because you are the real test kitchen! They also carry party kits. What is more fun than making your own sundaes and root beer floats at a sleepover! Your favorite combination of ice cream and toppings along with the kit tools will create the ultimate sundae sleepover and have your kids shouting for more." using one of their products. This is a company to share At the Fence. And the good news is they are going to give one Tomato Cutting Board and one Medium Nylon Knife to the winner of this giveaway! The Mandatory entry is to visit Curious Chef and come back and leave a comment telling me about an item you find interesting (other than ones mentioned here). Remember you must do this first before entering any other way. This giveaway will end 1/14 at 11:59 pm CST. You do not have to have a blog, but please leave a valid email where I can contact you should you win. I will use Random.org to select the winner. I will email and you will have 48 hours to respond before another winner is chosen. 1. Follow Curious Chef on Twitter. Here. Come back and leave a comment letting me know you did this. 2. Follow my blog, and leave a comment saying you are a follower. If you already follow let me know. 3. Follow me on Twitter. Here. Come back and let me know. Let me know if you already follow. 4. Tweet about this giveaway. Leave a comment letting me know. 5. Do a post on this giveaway. Leave a comment here with the link. Disclosure:I did not receive any monetary compensation for reviewing this product. I did receive the cutting board and knife to review. All quotes are taken from the Curious Chef Website. All thoughts and opinions are mine. We have a new winner At the Fence! Rebecca (Buttons and Bows), is the winner of the $25 gift certificate to Modest Apparel USA and she has already responded to the email. Congratulations Rebecca!! Everyone keep an eye out, 2 new giveaways will be posted by tomorrow evening!! Meet me At the Fence to find out what they are!!! Before long we had businesses contacting us asking how to order it in bulk. So we discussed how we could mass produce this kind of oil, and almost abandoned the product because we didn’t want to lose the traditional way of making it. In the end, we decided to just keep making it the same way, by having others in our coconut community also make the oil the traditional way. Many of our producers are in areas so remote, that if they did not use their coconuts to produce Virgin Coconut oil for us, no one would buy their coconuts because it would cost too much to transport them to manufacturing plants. In these areas, the coconuts generally just fell to the ground unused until we started training people to make our Virgin Coconut Oil. We were the first ones to export Virgin Coconut Oil from the Philippines to the US market. The success overwhelmed us. Today, more than 6 years later, there are other companies now selling coconut oil again in the US, most of them mass-produced by machines. But we are committed to time-honored traditional practices that have produced healthy coconut oil for hundreds, if not thousands of years. Our producers have learned a lot of things over the years, since most of them have been producing this oil for over 6 years now. They have learned how to pick out the best coconuts from each harvest that produce the best quality oil, for example. Their most recent discovery came in 2007 when certain groups in rural areas had problems with water sources. Water is needed to make the coconut milk from which the oil is extracted. Using true Filipino ingenuity, they started collecting and using the pure nutritious coconut water from inside the organic coconuts instead. They noticed that the water separated from the oil much quicker, and that the end result was a higher quality and better tasting Virgin Coconut Oil. Independent laboratory analysis shows this to be one of the highest quality coconut oils on the market, having the highest levels of antioxidants. 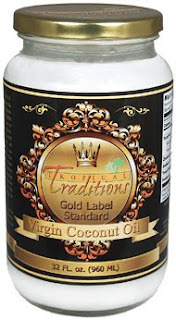 This enhanced Virgin Coconut Oil is now in the US market under the Tropical Traditions Gold Label brand. It meets our strictest standards to earn this designation. Today when you buy Tropical Traditions Gold Label Virgin Coconut Oil, you are buying the highest quality coconut oil we have to offer, and it is still made by hand and benefiting families in the rural areas of the Philippines where the coconuts grow." "How is This Oil Used? Virgin Coconut Oil is a food, and is one of the best cooking oils you can use. It has been a staple cooking oil for thousands of years in tropical climates. As a cooking oil, its chemical structure is kept in tact and therefore is resistant to mutations of fatty acid chains even when used in higher cooking temperatures, unlike most vegetable oils. Research shows that the medium chain fatty acids found in coconut oil boosts the body’s metabolism, raises body temperatures, and helps provide greater energy which can lead to weight loss. For hundreds of tasty recipes from people who use coconut oil, visit FreeCoconutRecipes.com." If you like cooking with an oil really good for your family this would be for you. We made some pancakes and my son hammed it up for a picture. 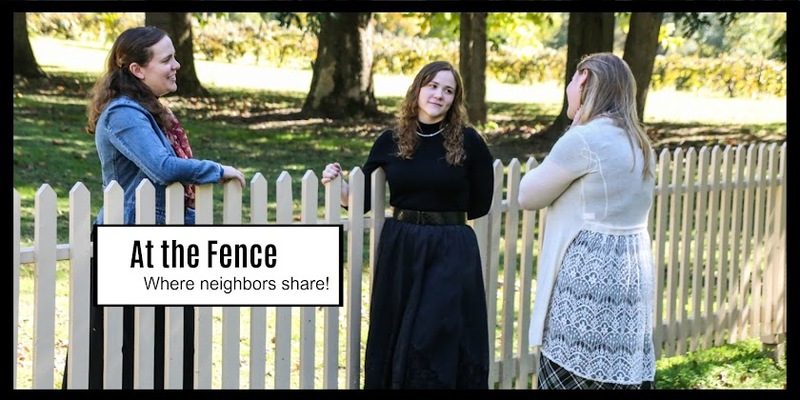 This is an item to share At the Fence. My daughter (24) wants to try some on her hair as she has heard that it is good for your hair. Disclaimer: Tropical Traditions provided me with a free sample of this product to review, and I was under no obligation to review it if I so chose. Nor was I under any obligation to write a positive review in return for the free product. Everything in quotations was taken directly from the Tropical Traditions Website. All thoughts and opinions are mine. Here is a spectacular giveaway. First, The Old Schoolhouse Magazine has a website here. They Are one of the best magazines around for home-schoolers. I read the magazines over again and again. I really enjoy this magazine. 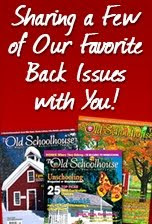 Old School House is full of articles, information, and products to help the home school parent. They give ideas for study, writing assignments, and projects. They visit homeschoolers in different places and tell you what they are doing. This is a magazine every homeschooling parent will love. You really need to look into this magazine. I noticed today you can get a subscription to their magazine for $7.95. This is normally $25. What a bargain. It is a limited time offer so hurry over and get yourself a subscription. The 2009 Planner is bigger and better than ever. 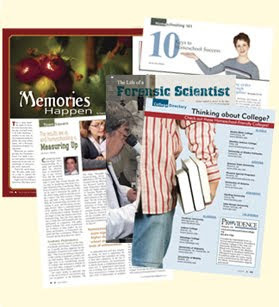 With more forms (over 40 ADDITIONAL forms are included), 12 new essays from favorite homeschool authors, including Amanda Bennett, Dr. Jay L. Wile, and Tammy Duby, 12 new, "Must-Know" lists, 24 new recipes, and more! Approximately 2,000 satisfied customers since we launched our Planner in 2008! "OK, listen up, homeschooling moms and dads. I have been busy looking through the 2009 Schoolhouse Planner – where was this gem when I first started homeschooling? We have homeschooled for seventeen years, and this is just what I have needed. I don’t know how The Old Schoolhouse® came up with helps for all of my needs, but this is complete, easy to use, and covers it all. Take a glimpse at some of the advantageous new pages featured in this complete home and school planner . . .
Calendar Pages for 2009-2012—planning and scheduling just got so much easier! 24 Recipes—from Mexican Lasagna to Loaded BBQ Potato Casserole! 12 Articles (one for each monthly topic) from homeschooling's most well-known authors. Here are just a few . . .
12 "Must-Know" Lists that correspond to the monthly topic/articles including these and more . . . Alphabet Writing Charts for Copywork—Beautiful! Ready to print and use! TOS Resource Lists—A huge inventory of ideas to include in your studies, corresponding to each monthly topic. With over 40, ALL-NEW Forms—You'll find just what you need and more with so much to choose from . . . Supplemental monthly modules will be available for purchase to enhance your use of the planner and incorporate them into your studies. Make learning come alive for your children with these all-new, interactive units! The 2009 Planner modules will incorporate lapbooking activities. Being organized is a priority for your home and school. 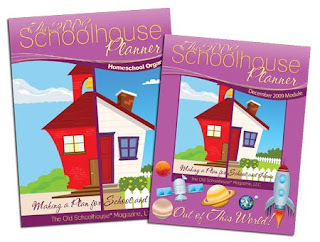 The 2009-2010 Schoolhouse Planner will make a monumental difference for you as a homemaker and homeschool mom in the busy months and years to come! The support and encouragement you'll receive are amazing! Now is the time to "Plan Your Best Year Ever!" God created a huge universe . . .
Help your children explore it with our latest module . . .
Our newest module is full of information, puzzles, quizzes, and more, all designed to make exploring God’s creation fun and exciting! Detailed text with added links to explain all of the different bodies in our galaxy and universe. An explanation of mnemonic devices to make memorizing the order of the planets fun. Activity pages that your children will love to work on! Quizzes, so that you can ensure your children have retained the lessons taught. Yummy recipes, sure to tempt the taste buds. Lapbook Beginnings, a wonderful way to jump-start your next lapbooking project. The high school expansion—we are including high school students on their own level. This allows the entire family to learn together. You’ll find all of this and more inside this module . . .
Out of This World! will help children to understand how the order of our universe works. We have searched high and low to bring you an educational, entertaining module that will leave your kids begging for more." Doesn't this sound helpful? Normally $43.95 and here you have the chance to win this E-book. I am impressed by all that is included. Go here and at the end of each description they have samples you may view. Very handy. This would really help some of us with organization. 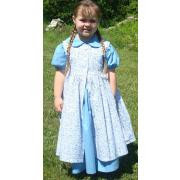 The site also carries other items in their store for home-schoolers. This is one that I will share At the Fence! You must do this before entering any other way. Go to the website and tell me about something else that caught your eye. Leave a comment and please be sure I have a valid email to reach you, should you win. You do not have to be a blogger to enter, but I must have a way to reach you. This Giveaway will end January 4th at 11;59 CST. I will choose a winner using Random.org. I will notify the winner by email, and you will have 48 hours to respond. If I do not get a response a new winner will be chosen. 2. Follow this blog. Leave a comment. If you already follow, leave a comment to let me know. comment. 1 entry each time. Remember only 1 a day. a link to your post. 1 entry. Comments are at the top of the post. Disclosure:I did not receive any monetary compensation for this post. All quotes are from the sponsors website. Thoughts and opinions are mine. 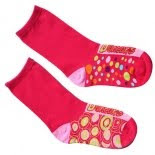 The winner of the U*neaks shoes and 2 pair of socks is Heidi! Congratulations Heidi! I have sent your information in already. And to the rest of my neighbors please check out the other giveaways and the new one I am posting today. I recently had the opportunity to try the Perfumed Body Moisturizer (Rose) from The Cream Perfume Company. I liked it and decided to write them and ask if I could host a review and giveaway. They have graciously responded. Not only do I have some more product to review I also have some to giveaway! First I would like to share some information about this company. "100% Healthy Natural And Organic Ingredients. No Harsh Chemicals. No Animal Testing. Effective And Safe. We Use Only Premium French-Made Perfumes From The Fragrance Capital Of The World, Grasse. " "We work exclusively with internationally renowned perfumers and the local artisans of Grasse to develop premium nature identical oil blends, ECOCERT certified organic essentials, absolutes and pure plant and fruit extracts. Our perfumes are all phthalate free and contain no sulfates, petro-chemicals, synthetic dyes, triclosan, GMO, PPG, MEA, DEA, TEA or formaldehyde donors. Our products are cruelty free." "We look for the world's best ingredients to luxuriously hydrate and repair your skin combined with unique fragrances to simply delight your senses. We focus on environmentally friendly packaging and overall eco-value. 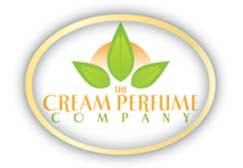 We are The Cream Perfume Company and simply make better scents, naturally!" Especially with the cold weather we need to be re-hydrating our skin. My family is spending part of the winter up north this year (usually we head south), and we are really experiencing dry cracked skin. So a body moisturizer is great. I recommend this product. It feels good and smells great. These lotions and perfumes would make a great gift. Now for the giveaway! I have 3 products that will go to one winner. I have: 1.The Perfumed Body Moisturizer (Rose de Rosee) 6 fl. oz. 2. The Perfumed Body Moisturizer (Coconut Vanielle) 2.5 fl. oz. and 3. Nuts Cream Perfume (Mango Poudre) .35 oz. All three to one winner! Doesn't that sound good! Hurry and enter, this Giveaway ends 12/31. Winner will be notified by email, so please leave a valid email. Must respond within 48 hours or another winner will be chosen. I will use Random.org to choose the winner. leave a comment for each tweet. Disclosure:I was given these products for review and received no monetary compensation. All quotes were taken directly from the website. All thoughts and opinions are mine. I am following both you and Vision Forum on Twitter and I "tweeted" about the giveaway as well. Congratulations neighbors!! I have already sent you an email. Please respond within 48 hours with your mailing information. If I do not receive the response within 48 hours I will choose another winner. The Eco Store recently sent me 2 products for review. The first being their Citrus Based Spray Cleaner. They also sent me their Herbal Fresh All Natural Shampoo for Dogs. Unfortunately I have been unable to use the second product yet as it has been so cold here lately, so I will do a second review later. "Eco Store has no nasty chemicals. No toxic petrochemicals No phosphates No benzene No bleach No nitrates No ammonia No chlorine No EDTA No synthetic dyes or perfumes"
I personally love the citrus smell, and that there are no harmful chemicals in this product. My 9 year old was excited, because she was able to use this product. She loves to help clean, but there are products I will not let her touch. She thought it was great to be given charge for the day of clean up in the kitchen. My bottle is almost empty. Eco store carries many products for your home and personal use. They have bath and body products, cleaning supplies, baby care and pet products. Each item is eco friendly. And the best news is they are presently having a sale on many of their products. An added BONUS! Visit their website here. This is definitely a product I would use again. I would like to recommend this product to you! I have a new giveaway. It is a $25 gift certificate to Modest Apparel USA. This company/ministry is dedicated to modest apparel for ladies. They carry clothing for both girls and ladies. I was impressed by the variety they carry. Anything from skirts, dresses, and jumpers, to school uniforms, and sleepwear. They even carry maternity clothing. skin tight or that didn't reveal more of their body than they wanted too. Simply put, modest clothing is hard to find. So we decided to have clothing made that we knew was modest, and it's all made in the United States of America. We have very high standards for quality and we will not sell an inferior garment. 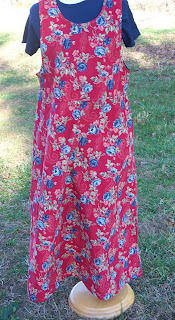 If you would like to see a certain style of dress offered here on modestapparelusa.com please e-mail us with a comment or perhaps a link to a picture. If we think it would be a style that would appeal to all our customers, we will consider adding it to our clothing line." 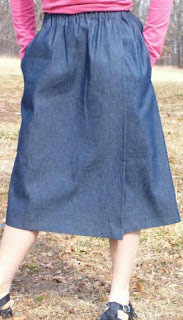 Modest Apparel USA is also available for wholesale orders. Go here. 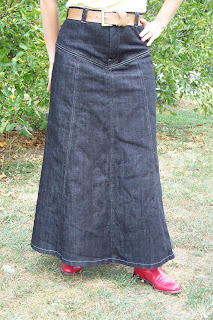 Now Laurie is offering the winner of the giveaway a $25 gift certificate to be used at her site Modest Apparel USA. This is one to share At the Fence. For the MANDATORY ENTRY, go to Modest Apparel USA and come back and leave a comment regarding an item you might like to purchase with your gift certificate if you win. This must be done before entering any other way. This giveaway will close 12/30 at 11:59 pm CST. Please remember to leave a valid email so I can contact you if you win. 4. Tweet about this giveaway. Leave a comment with a link. Remember giveaway ends 12/30 at 11:59pm CST. I will use Random.org to choose the winner. Winner will be notified by email. You will have 48 hrs to respond or another winner will be chosen. DISCLOSURE: All quotes in this post were taken from the website of Modest Apparel USA. I received no monetary compensation for this post. All opinions and thoughts are mine. My daughter sure was surprised when she got to be the one to try these new shoes out! As I opened the box she was breathing down my neck waiting to see them. U*neaks sent us one pair of White Paris Lace sneakers along with 4 pairs of socks, her favorite being the Princess/Splatters Crew Socks. She immediately tried them on and wore them around the home only. She has decided she will not wear them out here as we are up north right now and there is snow and they might get dirty! She loves them! The only thing I don't like? They only go to child's size 3.5. 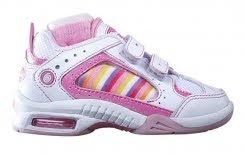 I have another daughter who would love them, but they don't come in her size!! These shoes are well made, and my daughter thinks the socks feel great. She is wearing a pair to wander the house right now. This is definitely a thumbs up product. U*neaks has sneaker style shoes with clear plastic window to co-ordinate with their specially designed socks, to customize your shoe each time you wear them. "U*neaks brand of customizable footwear was created by Ingenuity Express Corp. in Somerset, NJ. The footwear concept was invented and developed by company founders Steve Braynock and Jeff Gabriele, Ingenuity Express’ CEO. Both Rutgers University alum, Steve Braynock, came up with the product concept in 1990 and shared it with Jeff in 2003. Together they developed U*neaks, which included a collaboration with the Fashion Institute of Technology (FIT) in Manhattan, N.Y. On September 9th, 2008 Steve and Jeff were awarded patent number 7,421,806 for their customizable footwear system." 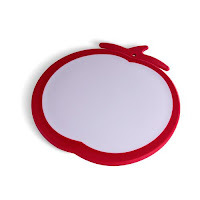 I'd like to recommend this product to you! 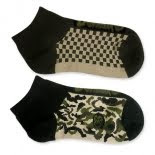 Jeff at U*neaks has been kind enough to offer one pair of shoes and two pair socks to one At the Fence Neighbor! Go to U*neaks and look through their shoes and socks, then come back and leave a comment on which shoe and socks you would choose if you won! COMMENTS ARE AT THE TOP OF THIS POST. US RESIDENTS ONLY. PLEASE PAY ATTENTION AND COMPLETE THIS MANDATORY ENTRY FIRST. EXTRA ENTRIES!! Please leave a comment for each extra entry. Leave a valid email address in each comment, as this is how I will contact the winner!! please still leave a comment. 3. Follow me on Twitter! (At The Fence) Leave a comment. 6. Enter another of my giveaways, and leave a comment telling me which one. 7. Become a subscriber. Leave comment letting me know. Disclosure: I was given this product for free for the purpose of reviewing it. I did not receive monetary compensation. All opinions and thoughts are mine. Quotes were taken directly from the U*Neaks website. ANSWERS IN GENESIS $25 GIFT CERTIFICATE GIVEAWAY!! We purchased a 5 year membership over a year ago and have returned there 14-15 times. They have many creation displays, a planetarium show that is magnificent, a petting zoo, and speakers that hold the interest of everyone in the family. My younger daughters of course love to see Buddy Davis. He sings about creation and often has a small show or craft activity for the children. I think they know most of his songs by heart! Two of my other children enjoy Jason Lisle and Carl Kerby. We even manage to catch them when they speak in churches we are around. This ministry has strengthened my children in their ability to deal with people who believe in evolution when we are on the street. When I get stuck I call one of them over. I would like to recommend this ministry to you! This Giveaway will also be posted on my blog Wife of a Street Preacher, but you may only enter on one of the two sites. Please do not enter on both. This will close at 11:59 pm CST on Friday December 18th. I will use Random.org to choose the winner. Please leave a way to contact you. You will have 48 hours to respond and then a new winner will be chosen if you do not respond. Now for the Giveaway! 2. Become a follower on this blog. the entry. I will not enter you automatically. You must follow publicly. 3. Sign up to receive their newsletter by email. Leave 2 comments letting me know. (2 entries) You need to go to their home page to do this. to earn the entry. I will not enter you automatically. for each button. Please leave a comment. COMMENTS ARE AT THE TOP OF THIS POST. I tried to change it, but can't.